Announcing Our Cradle-to-Prison Zine Series! We are proud to let everyone know that our new juvenile justice zine series was officially released yesterday. 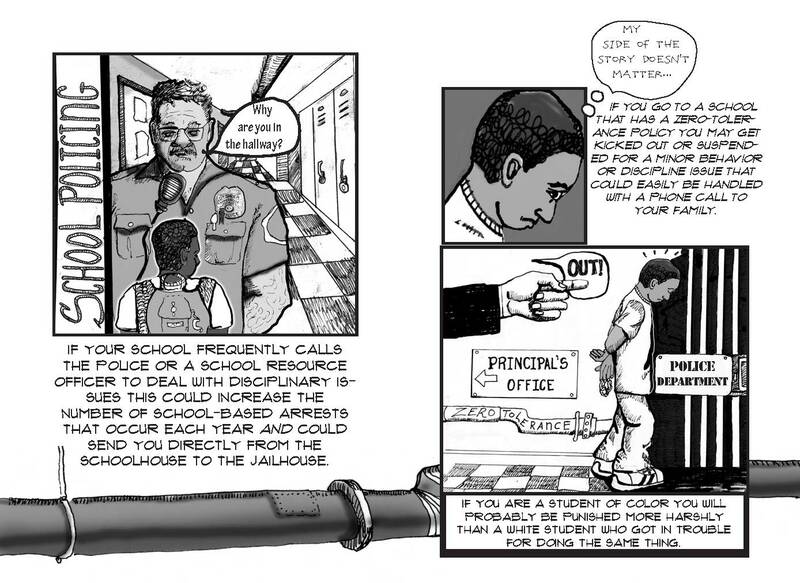 We invite anyone interested to visit the juvenile injustice site to download a copy of one of 4 zines available there. You can also visit the Cradle 2 Prison site for background information on the youth workshops that formed the basis of this project. This collaborative experience was a truly rewarding and wonderful one. Special thanks to our friend Lisa Lee, of the Jane Addams Hull House Museum for her support of the idea to create a graphic novel about the history and current manifestations of juvenile justice. Everyone involved agreed that this project would only make sense if we centered the voices of incarcerated youth as well as young people on the outside. We knew that we wanted to find partners who would share our vision and would have the skills to execute it. We found those partners and you are now able to review the results of our collaboration. The “Youth Stories” zine was created by teaching artist Elgin Smith. While Elgin himself is young, he has extensive experience working with incarcerated youth. We were lucky that he agreed to run a comic arts workshop for young men and women at the Cook County Juvenile Temporary Detention Center last August. That workshop forms the basis of the “Youth Voices” zine. The zine underscores the art and words of the incarcerated youth while also offering Elgin’s personal insights about being a teaching artist inside a youth jail. This is a unique publication and I have no doubt that all who read it will be fascinated and moved by it. Thank you Elgin for your diligence and your sincere care for young people! The three other zines were created by teaching artist Rachel Marie-Crane Williams. We were so incredibly lucky to meet Rachel and to be able to work with her. Rachel is an artist, an educator, and a passionate anti-prison organizer. All of these aspects of her being are reflected in the publications that she created. Rachel spent 5 weeks teaching a group of 9 youth on the outside about comic arts. We are grateful to her for her respectful and energetic interactions with the young people. She is an incredible talent. We were also blessed to partner with the Chicago Freedom School which provided a meeting space for youth and with Eva Nagao, the Freedom School’s new board co-chair, who took it upon herself to recruit young people for this project. Eva handled all of the logistics for the 5 weeks of the comic arts program for youth on the outside. Special thanks also to Rachel Shine who volunteered her time with the youth as they learned about juvenile justice and drew their own images. The Cook County Juvenile Temporary Detention Center (JTDC) welcomed us for 4 weeks in August 2010 to work with the young people who were incarcerated there. We are indebted to the youth for sharing their stories and talents with us. This project would not have been as seamless or as enjoyable as it was without the presence and guidance of Teresa Silva. Teresa’s steady hand and her soft touch moved us along and helped bring the project to completion. Thanks to Teresa for all of her contributions. There are few people in the world as unique and inspiring as Lisa Lee. Over the years, Lisa has fostered opportunities for youth and adults across Chicago to learn about history, art, and social justice. She does this without fanfare but always with unmatched generosity of spirit. This project would not have happened without her. We are eternally grateful to Lisa for all that she has done and will undoubtedly continue to do in the future. Finally, a point of personal privilege… I am committed to using art as a tool for social transformation and justice. I believe that art has the capacity to speak across difference and to help educate and incite people to action. I hope that those individuals who read these zines come away asking the question: How can I contribute to dismantling the prison industrial complex? If even only one person asks, then we will have done our part.